Stepping forward to carry on the sire line that produced him, this tremendous two-year-old has become a favorite of visitors to ORIgen with his powerful and athletic movement, superior length of body and overall eye appeal. 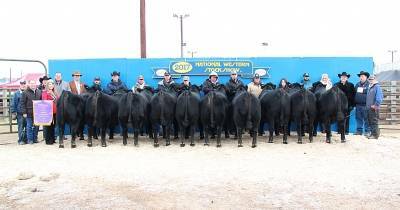 With nine daughters from his FIRST calf crop selling for an average of nearly $28,000 in the 2018 Big Event at Express, his progeny in the Basin, Express and Turner Meadow programs are setting new standards of excellence! 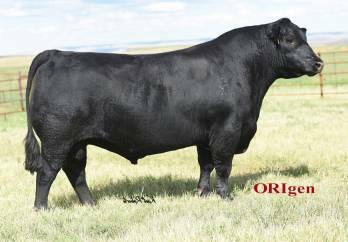 Ranking top 1% for $Beef value index, $Weaned calf value index and hot Carcass Weight EPD with a top 2% ranking for Marbling score EPD, Weaning Weight EPD and Yearling Weight EPD and a top 3% $Feedlot value index and a top 5% $Grid value index, this superior young growth sire is an excellent choice for breeding virgin heifers with a double-digit Calving Ease Direct EPD and a minus Birth Weight EPD that are both among the top 15% of the Angus population.